There are two ways that you can close your form, such that applicants can no longer access it. In order to manually disable the form, open the Form Settings. In the Advanced Settings section, you will see a dropdown labeled Enabled. 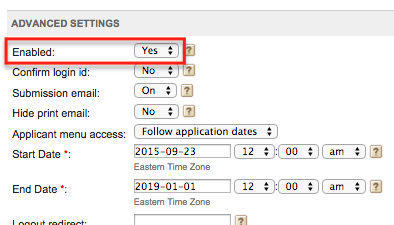 If this is set to Yes, the form will be active as long as the start and end date dictate that it's active. If this is set to No, it overrides the start and end dates and makes the form inactive. The applicant will be presented with a Closed message and will not be able to view or edit his/her application. If you know the date and time on which you would like the form to open or close and become unavailable to applicants, you can set the Start or End Date and Time in the Form Settings. 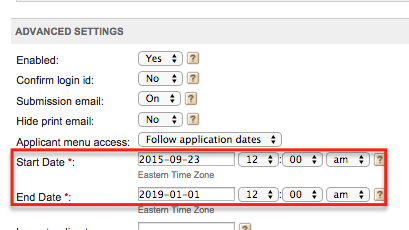 In the Advanced Settings area, you will see Start Date and End Date calendar picker, accompanied with dropdowns for time. Note that these times are in Eastern Standard Time.